High starting torque of 200% or greater achieved by sensorless vector control (when sized for heavy duty). Integrated auto-tuning function for easy sensorless vector control realizes high torque suitable for applications requiring it such as crane hoists, lifts, elevators, etc. Speed regulation at low-speed is greatly improved. Speed regulation at low speed has been improved to enhance process stability and precision. Frequency commanded by the inverter:0.5Hz. Motor:Hitachi's standard 3-phase 5.5kW 4-Pole totally enclosed type motor. 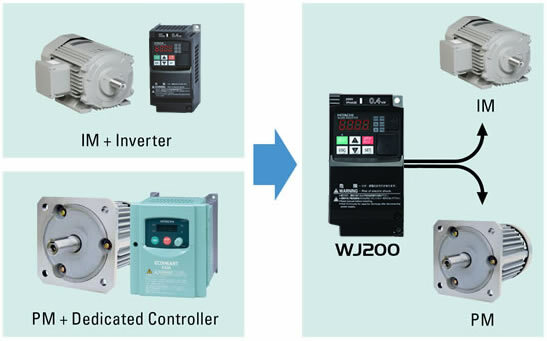 The WJ200 inverter can drive both induction motors (IM) and permanent magnetic motors (PM). Energy conservation and miniaturization can be achieved using PM motors. Moreover, one inverter used for two types of motor. Minimum time deceleration function, over-current suppress function and DC bus AVR function are incorporated. The functions reduce nuisance tripping. Improved torque limiting/current limiting function enables a load limit to protect machine and equipment. 2.3 sec. reduction of deceleration time without a braking resistor is achieved when the function is active. Turn off this function for lifting equipment.